Here I have some photos of how I converted two cushcraft Hf antennas into a Homebrewed version of the Cushcraft X7. 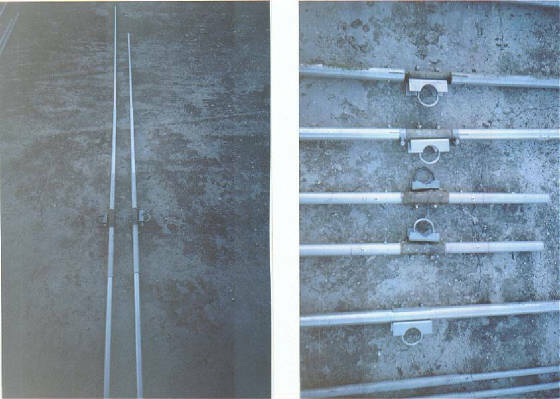 This is material from both a Cushcraft 3ele Triband & 3ele Dualband antennas.....9Z4CT was not happy with new location at the foot of mountains all around (He nearly sold all equipment).....I convinced him the X7 is really good antenna and would get out of literally the Hole he is now living in. Still after scraping the 3ele Triband & 3ele Dualband antennas, more material was needed...Seen here is mostly 1in and 7/8in aluminium tubing bought. 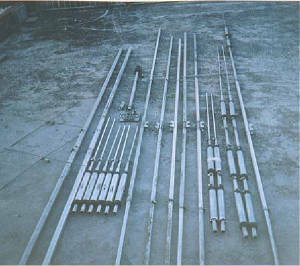 Here the boom from both antennas are combined...Actually the whole boom from one antenna plus just 1/2 from the other antenna to make up 18ft of boom....The centre piece had to be reinforced on the inside to support the weight.. I think Max Gain Systems http://www.mgs4u.com/fiberglass-tube-rod.htm in Georgia U.S.A has solid and tube fiberglass for sale.......I really would have liked to buy the size that would fit into 1in aluminium tubing but just went along with some homebrew tubes ...this really is homebrewing your own. 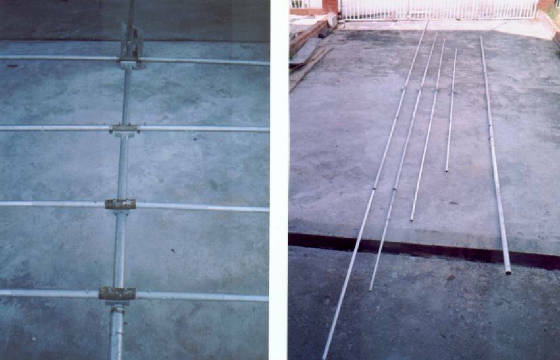 This is the connecting of the driven elements using flat aluminium and also seen is the matching system used. 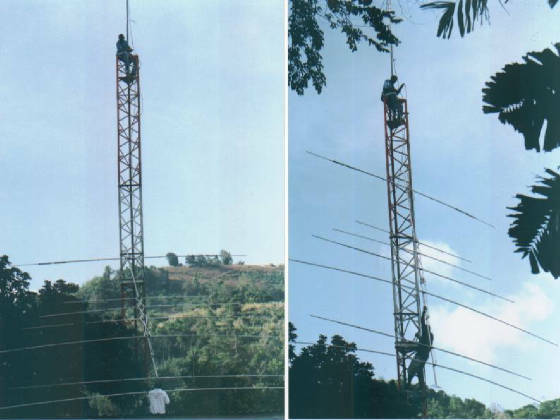 I get a real good swr on the bands the antenna is designed for...The antenna is fed with a single 50 ohm cable (RG8) into a 4:1 balun...I use a Van gorden balun but my first log periodic I ever built ,I used a homebrewed 4:1 coax balun.The article was found in an old CQ magazine and It works really well. 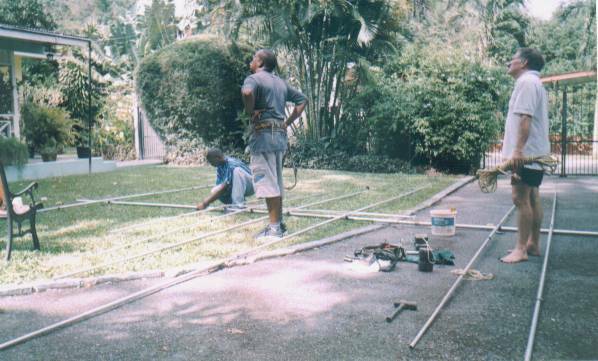 You can see me putting together the antenna while 9Z4CS-Jerome (centre) and 9Z4CT-Nigel (right) are thinking about renting a helicopter for installation. Ok ..Here we go up the tower..you can really see the size of this baby. We got full size elements on all bands ,all on an 18ft boom. The tower is 50ft. ISN'T SHE A BEAUTY !!!!!!! 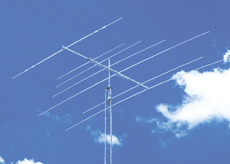 Compare her with the original Cushcraft x7 antenna below.. 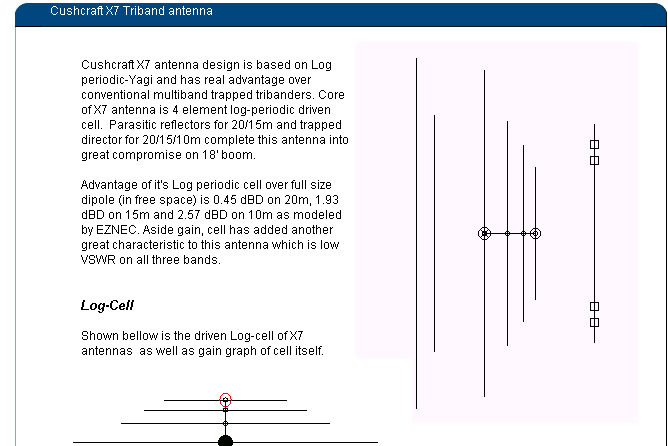 Here is a great overview of the X7 antenna by E73M---Click on photo to go to his site. 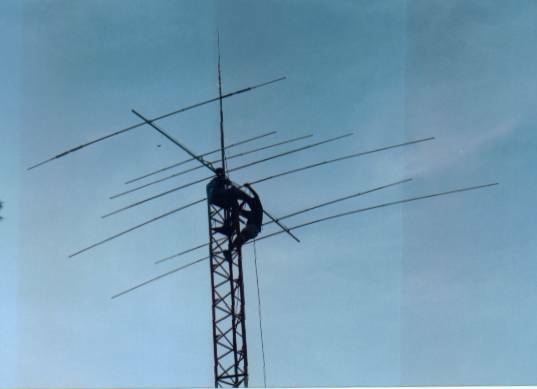 This is what I enjoy doing in Ham radio..I really love building antennas and I am happy to assist anyone who wants more info if they think they can build one like this. 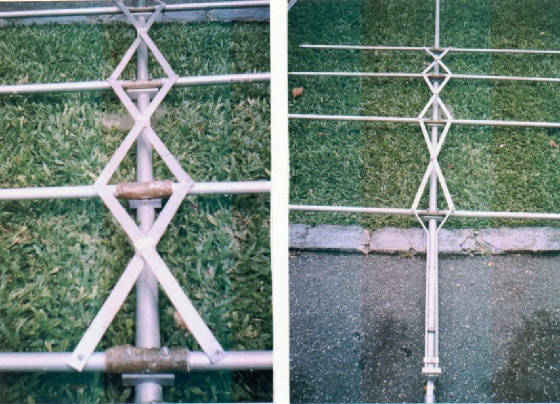 Cushcraft also has a 9 element version using a 24ft boom...I would have liked to put up that at my Qth but not enough space to get that size up.......Plus , after looking at the amount of gain on the X9 - too much material for just about a 1 db increase .